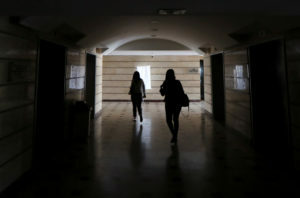 CARACAS, Venezuela (AP) — A widespread new power outage struck Caracas and several well-populated states on Monday, nearly two weeks after Venezuela was rocked by its worst blackout ever. Authorities gave no immediate statements about the outage, which began shortly after 1 p.m. and appeared to have affected as many as 16 of Venezuela’s 23 states, according to reports on social media. But many in the capital were already bracing for the worst, fearing a repeat of the chaos that swept across the country earlier this month when residents had to survive without water service and lost touch with loved ones abroad for several days. Shop owners in downtown Caracas pulled down shutters, while office workers left darkened offices early to try to catch a ride home. Shop owners in downtown Caracas pulled down shutters, while office workers left darkened offices early to try to catch a ride home after subway service was suspended. “I hope it’s short and doesn’t last days like last time,” said Carmen Arias, a 52-year-old secretary. President Nicolas Maduro blamed the previous outages on U.S. sabotage and heralded the resumption of electricity as a major victory for his government. The United States and Venezuela opposition leader Juan Guaido say the blackouts were the result of years of government graft and incompetence. William Rodriguez, who sells books at a kiosk under a highway overpass, said it was hard to know the extent of the blackout because communications were erratic at best. “The important thing is for people not to get desperate,” he said. Meanwhile, the U.S. government warned Russia that the reported dispatch of military personnel to Venezuela was increasing tensions there. U.S. State Department spokesman Robert Palladino said Secretary of State Mike Pompeo called Foreign Minister Sergei Lavrov on Monday and said “the United States and regional countries will not stand idly by” while Russia takes steps to support its ally, Maduro. Pompeo’s call came after a Venezuelan official said Russian aircraft arrived in Caracas this weekend as part of ongoing military cooperation. Reports that two Russian air force planes arrived could not be independently confirmed.